The Tennessee School Boards Association has announced a new data dashboard for school districts. 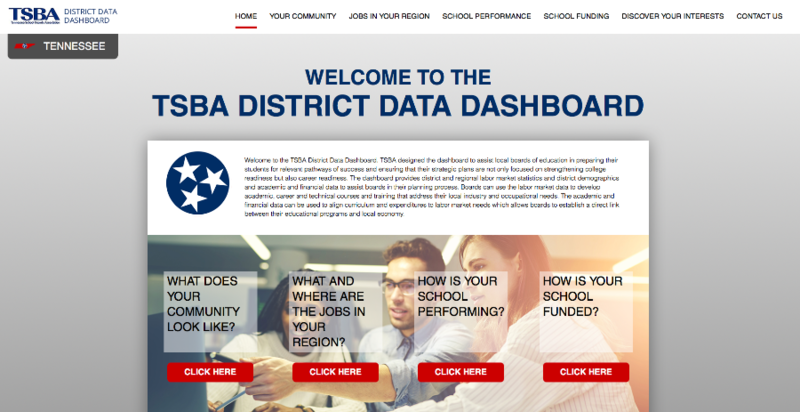 TSBA is proud to announce the new District Data Dashboard. TSBA designed the dashboard to assist local boards of education in preparing their students for relevant pathways of success and ensuring that their strategic plans are not only focused on strengthening college readiness but also career readiness. The dashboard provides district and regional labor market statistics and district demographics and academic and financial data to assist boards in their planning process. Boards can use the labor market data to develop academic, career and technical courses and training that address their local industry and occupational needs. The academic and financial data can be used to align curriculum and expenditures to labor market needs which allows boards to establish a direct link between their educational programs and local economy. To access the Dashboard visit, www.tsbadatadashboard.com. This entry was posted in TSBA and tagged School Boards in Tennessee, Tennessee School Boards, TSBA. Bookmark the permalink. So in other words they will drive a student to the choice the computer has selected for them in their career. Of course it will all be backed up by data. This is how kids in China are educated. A career is selected for them then the training begins. This is EXACTLY where we are going her in TN and across the country. It is all about human capital to fill the needs of the planned economy based on job predictions that are always wrong.